Season 1 of The Punisher ends with a bloody finale that strikes a familiar balance between satisfying conclusion and keeping the Marvel machine going. Although the season finale of Marvel's The Punisher utilizes the same recursiveness employed by the series premiere, in that the sense of meaningful conclusion — that is noticeably present as Frank finds retribution for his wife and children and effectively punishes those responsible — is offset by the sneaking suspicion that the ending, like the beginning, is more like hitting the reset button than it is turning the page on a significant chapter in the life of Frank Castle. That’s not to say the finale isn’t effective or satisfying in its own way; on a purely visceral level it might be the truest representation of the character in live-action yet, and certainly the most brutal, which is saying something, as previous on-screen iterations were all tagged with R-ratings that look distinctly less “Restricted” than their Netflix counterpart. 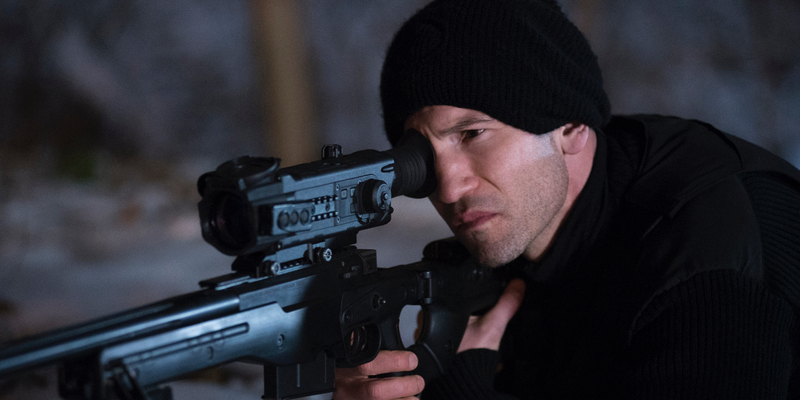 Bolstered by a strong, effectively emotional, and at times mercifully humorous performance by Jon Bernthal, The Punisher strikes the right chord in terms of how to depict an essentially one-note character onscreen and humanize him to a degree without necessarily watering down his inherent brutality. To the credit of showrunner Steve Lightfoot, depicting the right balance between those two elements was essentially the primary task of the season finale, which, coming in after 12 sometimes very long hours, boiled the character down to his most basic components and delivered a savage climax, the denouement of which might’ve resonated more had the season not started along such similar lines. In the end, it seems that a lot of the heavy lifting done by the Punisher’s appearance on season 2 of Daredevil was undone by the need to fill an overlong season by rewriting the character’s origin, as it acts as the most convincing defense of his methods. Frank can mow down countless adversaries, cut their heads off and attach explosive devices to them, or gouge the eyes of a man who was recently stabbed and beaten, but as long as the emotional context is his family, it’s (hypothetically) closer to being something the audience is willing to go along with. The problem may be that the Punisher’s origin story — his quest to right the wrongs against him and his family — is the only one that can reliably be told with the sort of emotional foundation (and justification) seen in season 1, which is why Marvel, Netflix, and Lightfoot all decided it needed to be retold. To turn the Punisher’s origin into a twisty military conspiracy is a smart move from the standpoint of executing a season of television, as the more labyrinthine the plot, the easier it is for the story to engage in digressions that don’t necessarily have to go anywhere before doubling back and exploring what’s around another corner. That works in the series’ favor as far as the first go-round is concerned, as The Punisher, like the other Marvel-Netflix shows, struggles to have a compelling enough story to necessitate 13 episodes, and in doing so falls into many familiar formulaic circumstances seen in the likes of Daredevil, Jessica Jones, Luke Cage, and, of course, Iron Fist. But unlike those series, the conclusion to The Punisher’s Origin Story 2.0 acts as a way out for its main character, not a way into more superhero-ing, as it is for his streaming peers. That raises concerns about the show’s future, as Frank will inevitably be drawn back into his war on those who need to be punished, but how, without the need for personal vengeance driving him, will the show be able to present it as anything other than a violent man waging war — possibly as a man who simply loves war, as was the case with Garth Ennis’s take on the character? For everyone whose argument is that The Punisher is more about loss than it is violence, any continuation of Frank Castle’s bullet-riddled story as a violent vigilante stands to unintentionally undo that perception. The viewpoint may be further undone by show’s decision to transform the beautiful Billy Russo into Jigsaw, and to state that the character’s mind was likely scraped away along with his face, hinting at a shift forward that is distinctly more comic book-y than the first season was. And with the goal of seeking vengeance for his family now resolved (again), it remains to be seen whether or not continuing the story of The Punisher will find a way to humanize the character the way it did here, and just how much that will alter the acceptance of the means to whatever end he’ll be seeking. That doesn’t necessarily undo the effectiveness of the finale in terms of telling a story about a guy who walks around with a skull emblazoned on his chest and who is frequently heard uttering the refrain “kill them all.” After what transpired in the penultimate hour, ‘Home’, in which Frank was brutally tortured within an inch of his life by Rawlins, who, in the moment was as consumed by a need for retribution as the man he was beating, only to rise up (with a self-serving assist from Billy) and dish out some over-the-top (ugh) punishment to the man behind his many woes, any concern that ‘Memento Mori’ would be a tame culmination of the season immediately went out the window. To its credit, the sense that The Punisher is as the Punisher does (i.e., brutal and violent) at least ensures that the story being told is done with the truest representation of the character in mind. So the fact that the finale so closely resembles the end game boss battles of Daredevil, Jessica Jones, and Luke Cage, serves as a test for the series in how well The Punisher can differentiate itself from its streaming siblings. Unsurprisingly, and yet effectively, the series leans on its lead character’s defining characteristic to ensure a bloody and brutal conclusion that goes well beyond the other shows. The Punisher was far from perfect; its biggest problems are the same problems shared by the entire Marvel-Netflix lineup. But despite being too long and relying on formulaic characters and episodic beats, the series largely delivered a satisfying close to its first season that also makes a strong case for why it should also be its last. Unfortunately, that’s not part of the Mighty Marvel Machine’s plan to continually churn out more. As such, what could have been an edgy one-and-done hit that found surprising depth and humanity to a character often thought to have none, will now likely face a greater challenge in returning a Frank Castle who has found a modicum of peace to a war he left behind, without it seeming unduly repetitive or, worse yet, unnecessarily cruel. The Punisher season 1 is available in its entirety on Netflix.